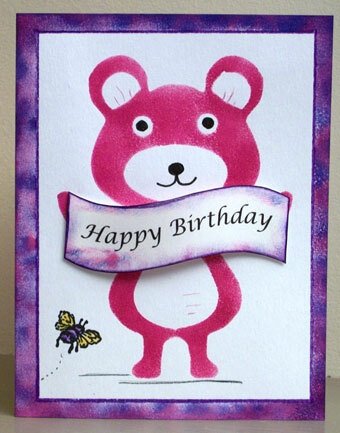 Download and print the bear stencil pattern to make a stenciled birthday card featuring a teddy bear holding a banner. Select the bear you want to use on your birthday card. Cutout your selected stencil pattern following the instructions in the Stenciled Bear Christmas Cards tutorial. The bear can be made with a banner held under his chin or across his belly. You can make this card for any occasion. A printable pattern with More Banners, including blank ones, is available for download. 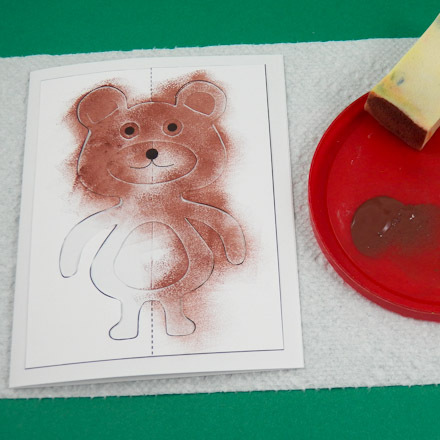 Make the stenciled bear card following the instructions in the Stenciled Bear Christmas Cards craft project. Add your own special touches to the card with rubber stamps or markers. The sample card features a bee stamp with a dotted flight trail. 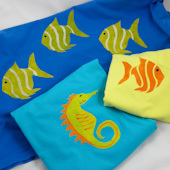 These printable patterns are from the Stenciled Cards tutorial. See this tutorial for detailed instructions on how to make stenciled greeting cards. Make the stenciled bear card following the instructions in the Stenciled Bear Christmas Cards craft project. That's it! Are you ready to stencil a bear? Tip: Make delightful Christmas cards with stenciled bears. 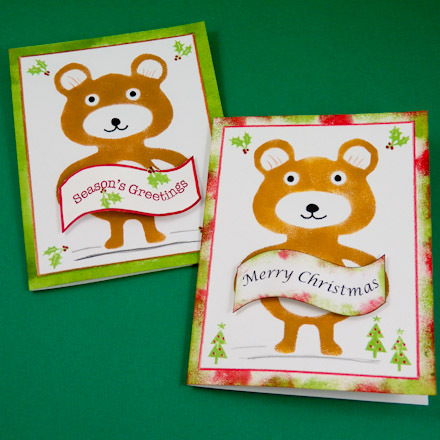 See detailed instructions in the Stenciled Bear Christmas Cards craft project. Tip: The Smaller Stencils in the Stenciled T-Shirts craft project can also be used to make stenciled cards. Print the pattern and cut out one of the stencils. Stencil following the instructions in the Stenciled Cards tutorial.